If you wish to concentrate on your school website rather than on technicalities, vhost4life is the most appropriate option for you. We offer a one-click installation right at signup. You can get a eTeaching hosting plan for only $5.00 per month, along with a brand new domain. 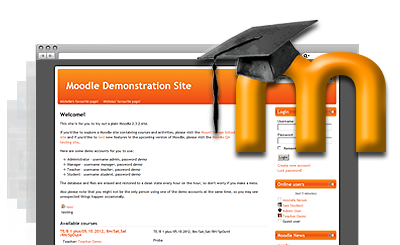 Moodle™ is a registered trademark of Martin Dougiamas and shares no affiliation with vhost4life. E-Teaching web hosting made easy with vhost4life! vhost4life covers all requirements for hosting e-teaching sites. vhost4life offers an excellent technical support service. Offered at a low price, this shared web hosting package is a perfect choice for a personal website. This shared web hosting plan is the best choice if you want to build an online store. A moderately priced shared hosting plan, perfect for advanced personal websites. An excellent choice for housing multiple popular websites in one shared hosting account.